As many of you know, our classroom has been full of excitement since our Painted Lady caterpillars have arrived! 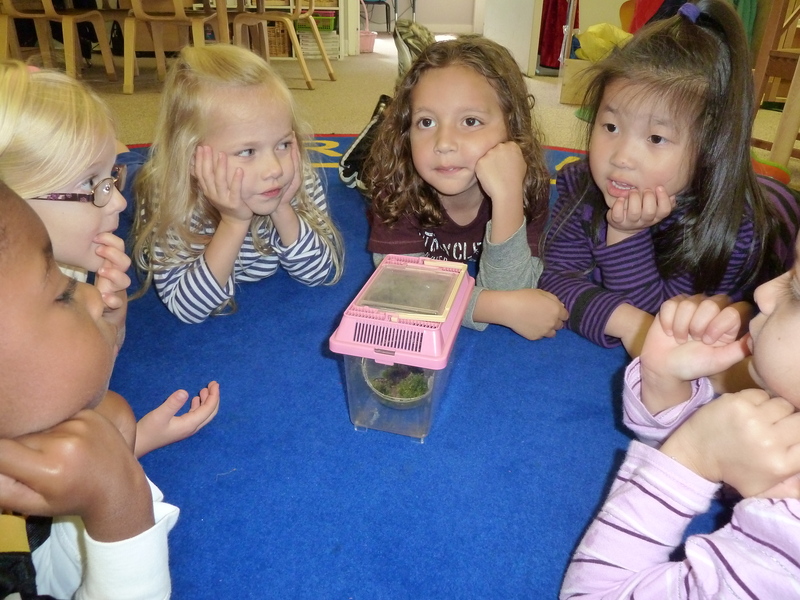 The students watched anxiously as they grew in size each day, taking in each and every detail. One by one, they begun making their chrysalises and so began the waiting game. The students knew what would happen next, but the anticipation seemed to grow with each day. Then, one magical morning, one butterfly had wiggled it’s way out of it’s cozy house to greet the day in it’s new magnificent form! The students watched in amazement as the butterfly walked around the house stretching and fluttering it’s new wings. 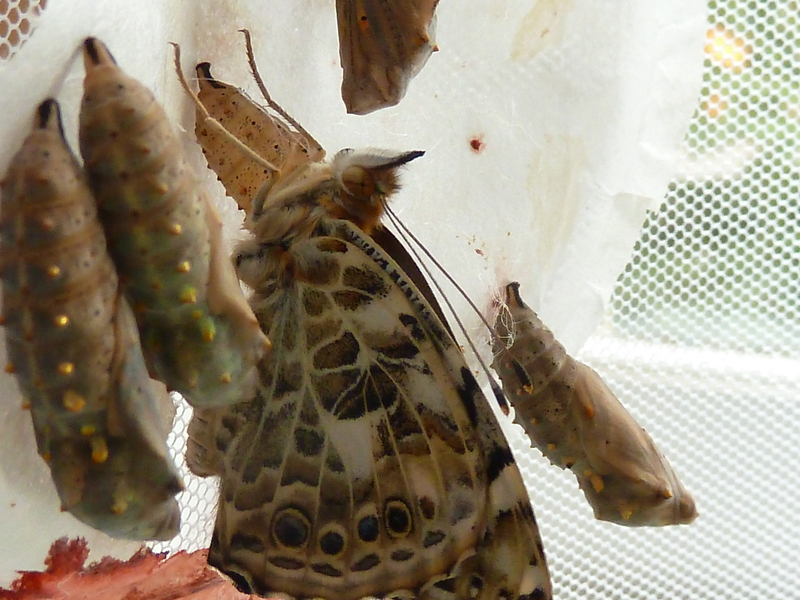 It was not long before the other butterflies followed suit, giving us a total of five beautiful butterflies. In a few days, when the butterflies wings have had a chance to dry, we will release them into the wild where the life cycle may start again. Another addition to our classroom has been twenty-five silkworms. While they arrived around the same time as our caterpillars, they were delivered in egg form (not much larger than a grain of salt) and took several weeks to hatch. 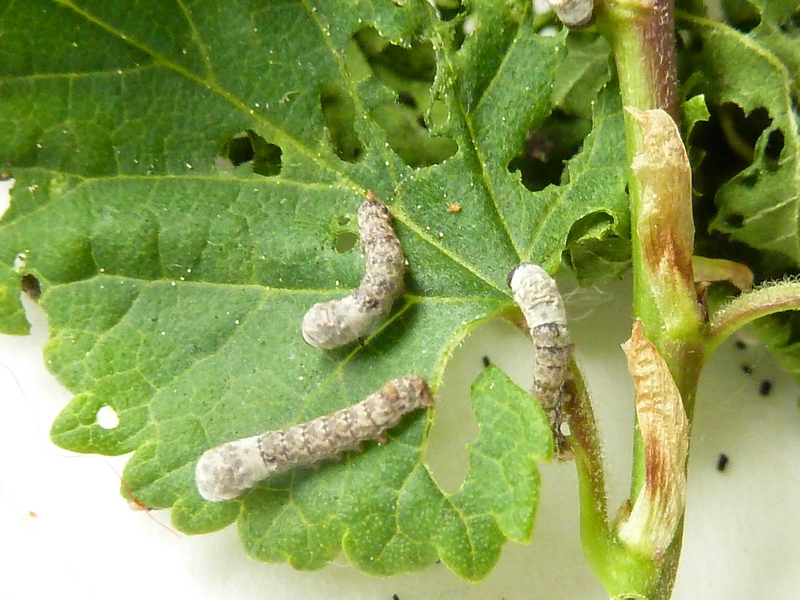 After a great deal of waiting, several extremely tiny silkworms finally began to emerge! Since then, they have been happily hanging out in a cardboard bowl, eating their weight in Mulberry leaves. We love watching them grow and look forward to what new and exciting changes lie ahead. On Friday, we found two very fuzzy new friends on our playground. The first was a “Woolly Bear”, otherwise known as the larva of an Isabella Tiger Moth. The second caterpillar was a fluffy white one known as a Fall Webworm. After taking turns holding the Woolly Bear, we put both caterpillars in an observation box so we could keep an eye on them. We looked in Peterson’s First Guides: Caterpillars, by Amy Bartlett Wright, to find out what kind of caterpillars we had found and what we should feed them. The Woolly Bear eats dandelions and low growing weeds. Ours seemed to enjoy the moss that the children had collected as well. The Webworm eats maple, oak, and other tree leaves, so we simply collected a few maple leaves for it. This morning, we found that the Webworm had changed over the weekend. It is now wrapped up tightly in a fuzzy cocoon. The children were very excited to share that they knew all about cocoons already and announced that a butterfly would soon emerge. I haven’t decided if I’m going to explain the differences between butterflies and moths, yet. I usually spend a lot of time on this subject in the spring when butterflies are prevalent, but one must take advantage as an opportunity presents itself, yes?